You can either make a booking directly on this website by using the "check availability box" to the left. Or you can call our office at (888) 934-1116 and a receptionist will be glad to help you. We offer several homes, some of which allow pets and some do not. You can either look at our properties online by clicking on the "vacation rentals" tab above and see if the home you are looking at allows pets. Or you can email our office at [email protected] and a receptionist would love to help find a home that is just right for you and your pet. 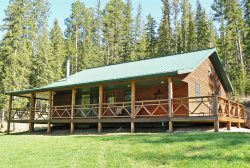 Our vacation homes are stocked in such a way you feel like you are coming "home" to your "vacation home" rather than returning to a small hotel. These homes have full kitchens, some have hot tubs and laundry facilities. You will enjoy a full service home while you are on vacation rather than a small, cramped hotel room.